■ A maximum of 2-cm transverse incision is made ipsilateral to the tumor two finger breadth medial to the anterior iliac spine on the mid clavicular line high in the iliac fossa. ■ The abdominal wall muscles are divided along their fibers until the peritoneum is visible. ■ Bluntly, the peritoneum is progressively separated from the muscles using your forefinger until you can palpate the psoas muscle posterior, the lumbar spine medial, and the pulsation of the common iliac artery caudal. 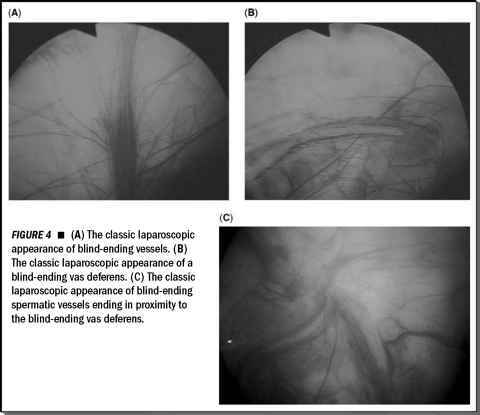 Lymphatic tissues in this area are dense and care must be taken to prevent injury of the inferior mesenteric artery, which constitutes a landmark to preserve the left sympathetic nerves. ■ A 10-mm operative trocar is introduced in the extra peritoneal space on the mid axillary line midway between the 11th rib and the iliac crest which is controlled by the finger through the iliac incision. ■ Gas insufflations is connected to this trocar. ■ The laparoscope is introduced through this trocar and under direct vision the forefinger completes the dissection of the extra peritoneal space as high as possible. ■ At the anterior axillary line approximately 5 cm above and 3 to 4 cm medial to the operative trocar a 5 mm trocar is introduced under double control of the forefinger and the laparoscope. ■ Through the iliac incision under direct vision a blunt tip 10-mm trocar is introduced and the distal balloon is inflated. ■ Care in trocar placement and dissection is important because peritoneal perforation will result in pneumoperitoneum, which may preclude continuation of the planed procedure. ■ The iliac trocar is used for the laparoscope and the other two are operative ports. ■ The extra peritoneal space is developed until the ipsilateral great vessels are reached and the ureter is visible. ■ If possible the ureter remains attached with the gonadal vessels on the posterior peritoneum. No dissection is done along the anterior wall of the aorta below the origin of the inferior mesenteric artery, so that the superior hypogastric nerve plexus is not injured. Posterior division of the lumbar arteri-ovenous vessels is not necessary and retrovascular lymphadenectomy may be performed by skipping between the lumbar pedicles.